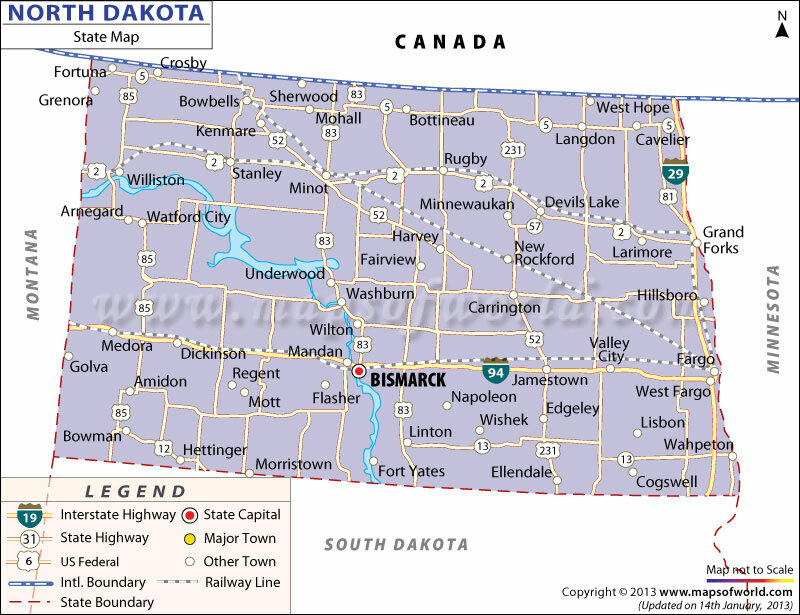 North Dakota is the nineteenth-largest state in the United States covering an area of 70,704 square miles. North Dakota is a state located in the mid-western region of the United States, along the Canadian border. The state is bordered by the Canadian provinces of Saskatchewan and Manitoba on the north; by Minnesota on the east, South Dakota on the south; and on the west by Montana. The Red River Valley: Lying on the eastern portion of the state, is a flat region called the Red River Valley. It is one of the most fertile regions in the world ideal for wheat cultivation and other crops. The Drift Prairie: Lying to the west of the Red River Valley, is a hilly area called the Drift Prairie. The region consists of hills, streams, valleys, and lakes. The Great Plains: Almost half of North Dakota is occupied by the Great Plains. This region is marked by hills and rich mineral deposits are abundant. The south-western part of the state is covered by the Badlands that is a row of beautiful monuments. The highest point in the state, White Butte, lies in the Badlands. North Dakota generally has a semi-arid climate. The highest temperature recorded in North Dakota was 49° C, at Steele on July 6, 1936. The state recorded its lowest temperature of -51° C, at Parshall on February 15, 1936. Occasional rainfall, snowfall, hail, blizzards, tornadoes, thunderstorms, and high-velocity straight-line winds are likely to occur. Flooding in spring is common in the Red River Valley area. The most destructive floods occurred in eastern North Dakota in 1997.